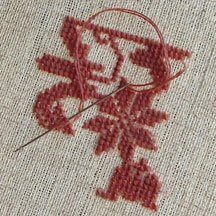 It’s true I’ve just started stitching on the Mary Wigham sampler – you can see I’ve only completed about an inch square! But I think it will be a fun project for me, I know I will enjoy working the individual medallions in solitary colors. I’ve chosen 40-count Lambswool Linen to stitch on and am using the DMC colors as charted. « Art is everywhere you go!